A Birthday, Mothers Day, Christmas or simply as a Thank you, our Gift Certificate makes the perfect gift for any occasion. Easy to organise, you can purchase online. To release the Gift Voucher go to my account in the shopping cart where it will be parked. On the bottom Right Corner you will see Send GV. Follow the instructions. You will have the option of writing a greeting. 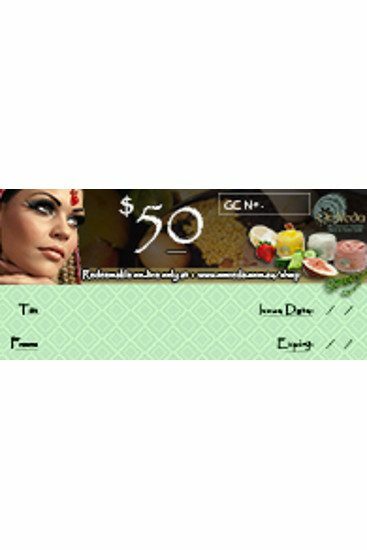 The recipient will receive their gift voucher via email. They will need to create an account if they have not used the cart, and if they are a regular customer they should log in as a returning customer. They will proceed to purchase : note: there is a box on the checkout that has the value of GV. The recipient does not have to use it all at the same time, at checkout they just apply the amount they want to use, and the cart will hold the remaining for them.